Oh, the classic French tips. I think French-tipping your nails is one way to make them look fresh and neat. It also makes your nails appear longer. I've tried French-tipping my own nails many times before but I always always always failed in those attempts. So I got myself some French tip manicure guides. I got this from Etude House. Basically, the "guides" are stickers that work like stencils. 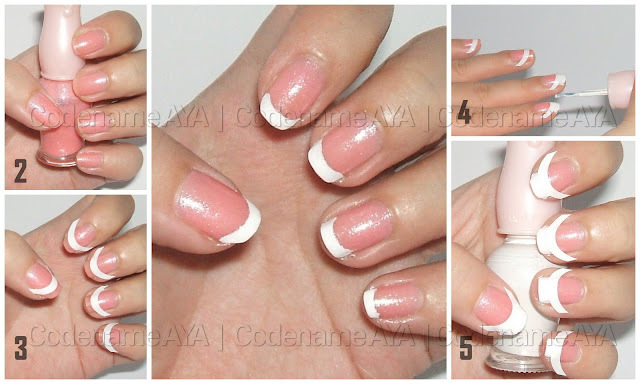 For this tutorial, I am using a sheer pink nail polish as base and white for the tips. Apply your favorite base coat to prevent your nails from staining. Apply your base color. In the classic French tip, the base color is just clear. Wait for the base to dry COMPLETELY. I usually wait for a couple of hours before proceeding to the next step. Put the sticker on your nail. You can put it anywhere on your nail, depending on how thick you want the tip to be. Paint the tips white using the sticker as a guide like a stencil. Let the tips dry COMPLETELY and then gently peel off the stickers. Apply your favorite top coat. I got my sticker set from Etude House for only P28. It has 45 stickers in it. That's good for several uses already. You can even reuse the stickers if you're careful in using them. And that's it! Super easy and neat French tips. You can also use these stickers for other nail designs by positioning them in different ways on your nails to get different shapes. I bought that French Tip guide too haha. I'm loving it! I do this too!! Although I haven't in a long while, I always use this trick. I love french tip nails. I should've known this before baka hindi ako nahirapan to apply french tip. :)) thanks for sharing this aya! Wow! Tagal ko na gusto mag french tip laging fail. hahaa May nabibili naman palang stickers, mura pa. Thanks Aya!